The new PremiumV2 tier gives you faster CPUs, SSD storage, and doubles the memory-to-core ratio of the existing pricing tiers. With the performance advantage, you could save money by running your apps on fewer instances. To scale up to PremiumV2 tier, see Configure PremiumV2 tier for App Service. 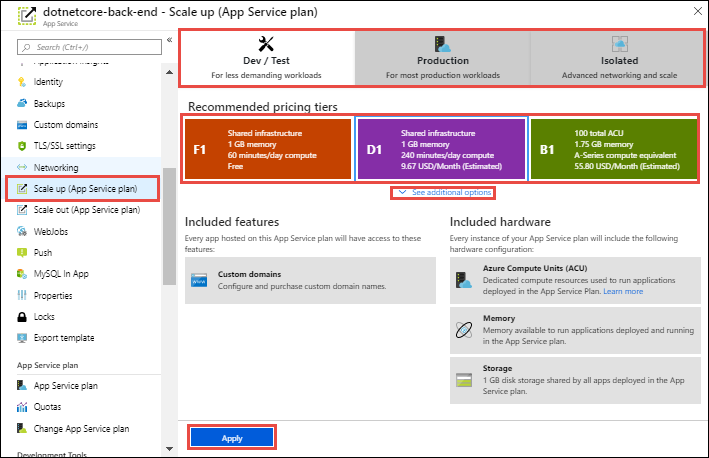 This article shows you how to scale your app in Azure App Service. There are two workflows for scaling, scale up and scale out, and this article explains the scale up workflow. Scale up: Get more CPU, memory, disk space, and extra features like dedicated virtual machines (VMs), custom domains and certificates, staging slots, autoscaling, and more. You scale up by changing the pricing tier of the App Service plan that your app belongs to. Scale out: Increase the number of VM instances that run your app. You can scale out to as many as 20 instances, depending on your pricing tier. App Service Environments in Isolated tier further increases your scale-out count to 100 instances. For more information about scaling out, see Scale instance count manually or automatically. There, you find out how to use autoscaling, which is to scale instance count automatically based on predefined rules and schedules. The scale settings take only seconds to apply and affect all apps in your App Service plan. They don't require you to change your code or redeploy your application. For information about the pricing and features of individual App Service plans, see App Service Pricing Details. Before you switch an App Service plan from the Free tier, you must first remove the spending limits in place for your Azure subscription. To view or change options for your Microsoft Azure App Service subscription, see Microsoft Azure Subscriptions. In your App Service app page, click All settings, and then click Scale Up. Choose your tier, and then click Apply. The Notifications tab will flash a green SUCCESS after the operation is complete. 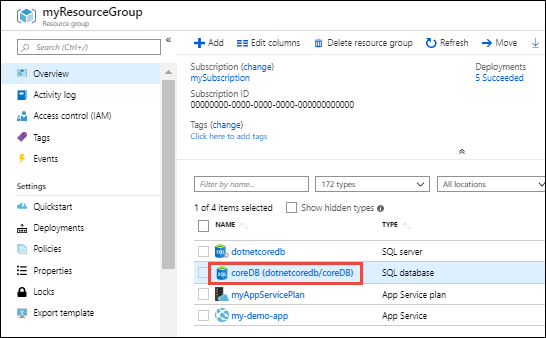 If your app depends on other services, such as Azure SQL Database or Azure Storage, you can scale up these resources separately. These resources aren't managed by the App Service plan. In Essentials, click the Resource group link. In the Summary part of the Resource group page, click a resource that you want to scale. The following screenshot shows a SQL Database resource and an Azure Storage resource. For a SQL Database resource, click Settings > Pricing tier to scale the pricing tier. You can also turn on geo-replication for your SQL Database instance. 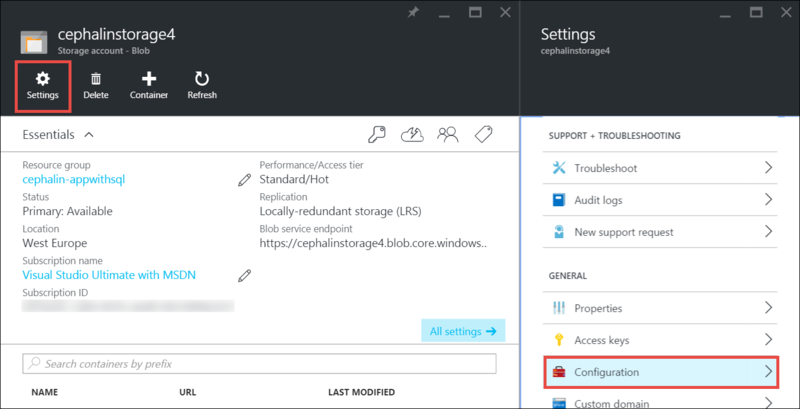 For an Azure Storage resource, click Settings > Configuration to scale up your storage options. For detailed information, such as VM sizes for each pricing tier, see App Service Pricing Details. For a table of service limits, quotas, and constraints, and supported features in each tier, see App Service limits. For information about Azure App Service best practices, including building a scalable and resilient architecture, see Best Practices: Azure App Service Web Apps.